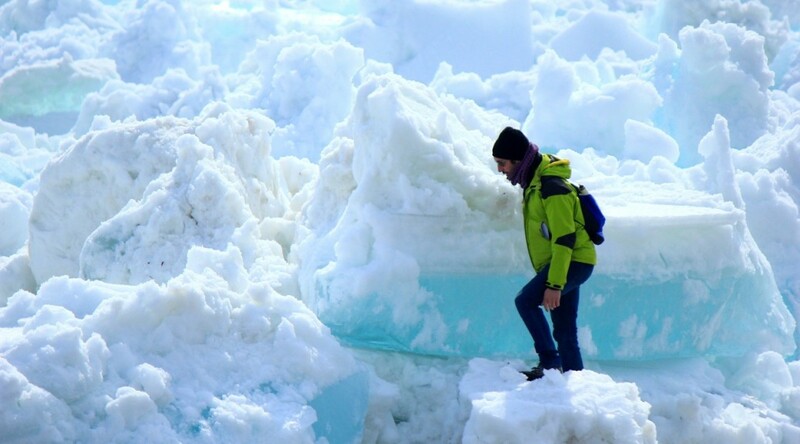 Yesterday, everything looked calm and quiet, but this morning, the Ienisseï has become a chaotic ice field. It’s impressive how in few hours, we move from an equilibrium system to chaos. All morning long, ice moved until a new ice-jam was formed and blocked everything, once again. For us, it is forced vacation…until open water reappearance. Second day of sampling in hovercraft. Ice free spots are more and more important but patches of ice are still stable. Ice is breaking and it won’t be long for it to move quickly, although tonight water level seems to be stabilized and everything looks very calm. Today, the quantity of sediments is less important, but the color of the dissolved fraction is darker. We are getting better in managing spring flood sampling. 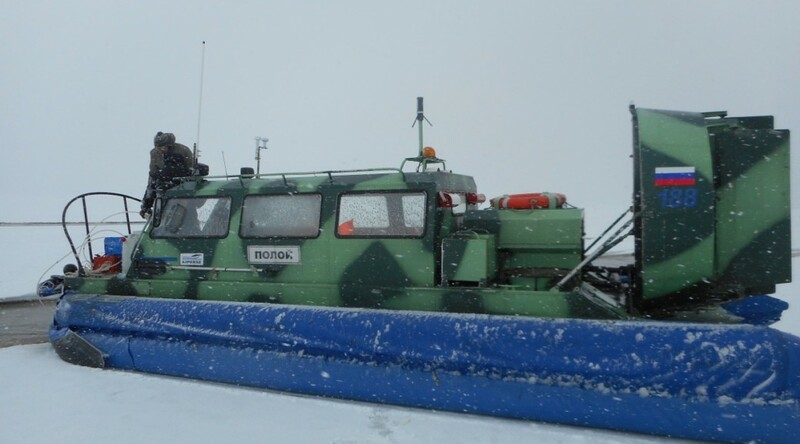 Indeed we already sampled with the hovercraft two days after the last sample with snowmobile (6 days last year) and we are confident in having high-resolution sampling of the spring flood peak. Sacha (hovercraft pilot) did a great job in a typical white day (snow flurry and fog) to find a ice-free sampling spot (4 meters wide channel). Harder filtration, Better color, Faster flow, Stronger water, Our Work Is Never Over. 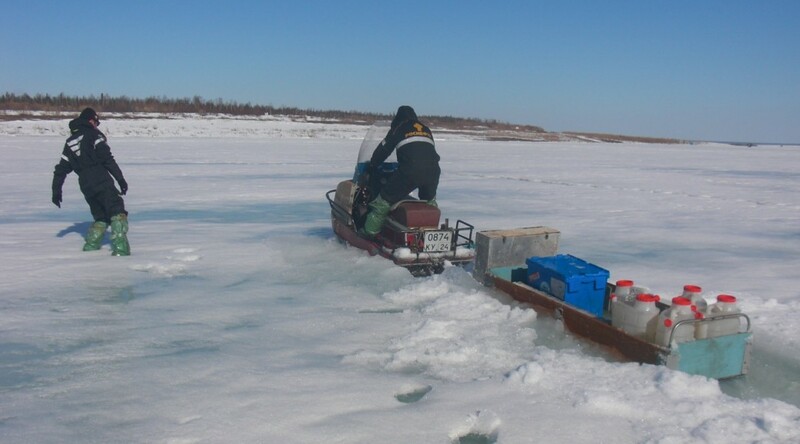 We had planned to go early on the Ienisseï to take avantage of a well frozen top layer and to avoid melt lakes. 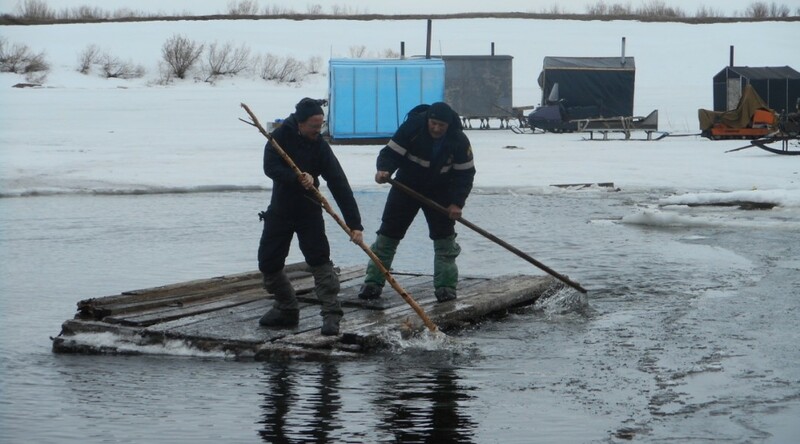 According to Anatoli, it would probably be the last day of sampling with the « Bouran ». But the Ienisseï chose not to, a big opening appears on the whole width of the river (3km), preventing access to the field. As last year, the last sampling in snowmobile will have occured on the 12h of May. 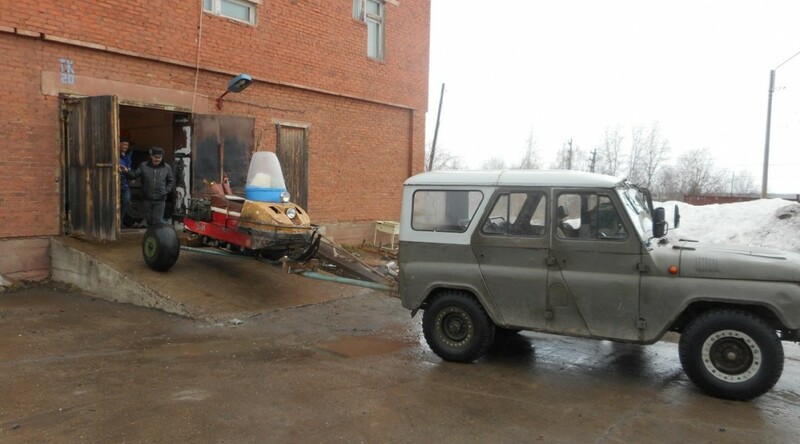 We had booked an hovercraft for the 17h of may, we will try to bring it forward to tomorrow. Thawing time is really coming. Tonight the entire lab was celebrating Sergueï’s birthday. As last year, we are still on the ice on the 12th of May. By getting early on the field this morning, sampling was quite easy today. 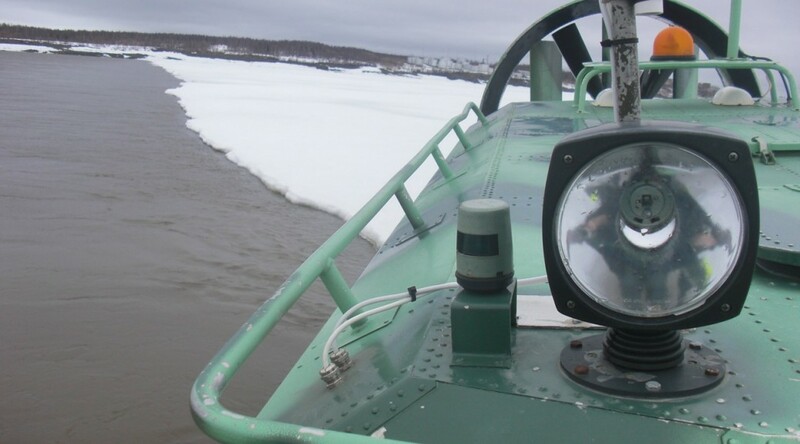 The hovercraft sampling’s schedule has been stopped and tomorrow we hope to sample with the snowmobile. It’s snowing and the temperature is slightly above 0°C. Water’s color starts changing, spring flood is coming. Today was a sampling day. 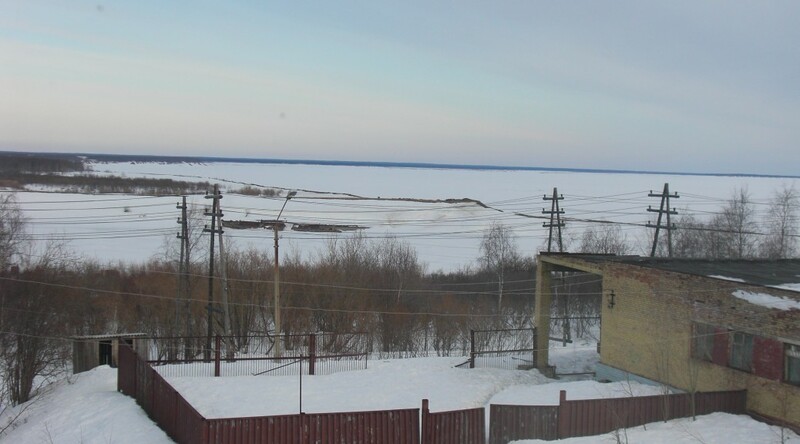 Roman has just arrived in Igarka for the in-between ice/water period. We managed to sample in snowmobile (« bouran ») but melt lakes are getting wider and deeper! Anatoly’s experience is very useful when we get bogged down. Tomorrow is going to be warm (+4°C and rain). We will go earlier in the field to take advantage of the re-freeze of the night. The second intensive sampling mission started on may 1st. Theo just arrived in Igarka and started filtration. Ieniseï river seems to be very calm but spring is coming.